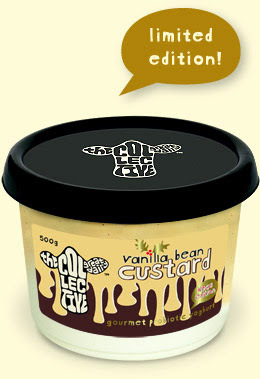 My vow to take it easy on the treat front in the lead up to Christmas went totally out of the window yesterday with the arrival of a pot of The Collective’s Xmas Edition Vanilla Bean Custard premium yoghurt - thoughtfully accompanied by the most delicious of mince tarts. I was powerless in their grasp! Thankfully, it is far lighter than your traditional custard and contains all of the goodies that come with their wonderful yoghurt such as probiotics like acidophilus, bifidus and casei cultures, and it’s also gluten free, gelatine free and preservative free. Hurrah for that! I can see pots of this getting a serious workout around our house as long as it’s in stock as it can be used on just about anything, and the fact that it tastes like pure heaven just makes things that much sweeter. Oh and it’s available now, RRP $5.99.